Closing is everything that moves the sale forward. Yes, an effective greeting is closing because it moves you closer. And of course, getting that final TMO commitment is closing. When you get an objection like, “I’m not buying because…”, handling it means you’re also closing. I have close to 100 or so closes I personally used. About 10 of them are my (and your) ‘go to’ closes for 90% of the situations you’ll run into. The others are ‘special situation’ closes. If I just listed them, you might memorize the list but you wouldn’t be able to use most of them effectively. When to use it – timing is everything. 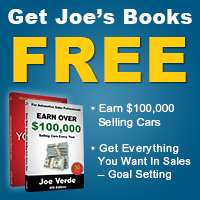 How to set it up – you don’t just blurt it out. What to say next – or you’ll just end up with dead space and you’ll get more objections. I usually cover the ‘go to’ closes I used daily like the ‘gas savings’ in 75% of negotiations, and objection techniques like the ‘reduction to the ridiculous’ when you need $45 more on a deal, and always C.R.I.C. I get a lot of requests for those ‘other’ special closes though, so we’ll spend more time on those in here, too. 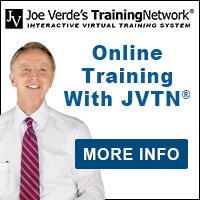 Just remember when you’re taking the ‘closing’ courses on JVTN®, in class, or in here … slow down. Don’t just watch a video or read it. Go over it again and again to understand it. And never just ‘try’ it – practice and practice each one until you’re comfortable using it. Master these go-to closes first, they control 90% of your paycheck.